That is a wonderful way of saying it. Flowers just bloom for their blooming. They do not need reasons. 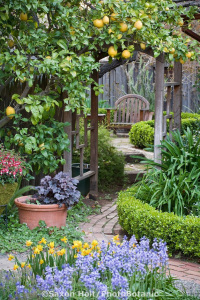 I think that’s a lemon tree in the picture. What a lovely garden! It really is a piece of heaven there. That reminds me of the song called the Lemon Tree. Yes, Mary Oliver has a wonderful way of catching the poetry of living. The Ground, the Earth, is Holy.